Peel Road Runners hit the roads and parks at home and away last weekend. Over in Spain, club chairman Lee Rickards pounded the streets of Barcelona running his first marathon of the year, finishing with a time of 3hrs 24mins. Back at the home of British Grand Prix, runners were taking on the Silverstone Half Marathon. 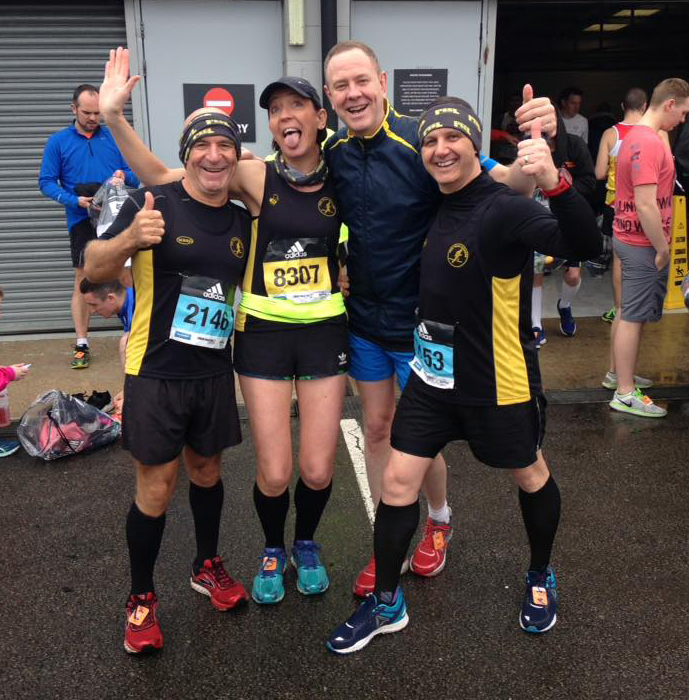 The popular London Marathon warm up event saw Peelers take to the circuit in wet and windy conditions with Sandra Ingram representing the female Peel Road Runners crossing the chequered flag in 1:55:14hrs. Malcolm ‘Bembo’ Bembridge picked up an injury just after the half way point but still managed to finish in a credible 1:45:43hrs. Phil Neale completed the course in 1:48:21hrs and Darren Truman finished with a time of 2:09:57hrs. Locally there were much better running weather conditions for the Florette Fradley 10k run. A popular two-lap event around the village and surrounding areas saw Michael Shelton breeze home in 57th place finishing with a time of 40:25mins. Following Shelton home were fellow Peelers Marcus Fairburn with 49:22mins, Lisa Crane finished with a new PB of 50:43mins, Darren Cotton in 50:56mins and Sue Fairburn in 59:08mins. Saturday saw Bob Donovan down in London taking on the Thames Meander Marathon. Recent weather conditions made the course very challenging in places with areas of the course under two feet of water. Not to be put off, Donovan and the other runners waded through all of the obstacles and he crossed the line in 224th place with a time of 5:31:38hrs. On parkrun duties, Matt Smith ran at Walsall Arboretum Parkrun finishing with a time of 19:36mins. Over at Kingsbury Water Parkrun, the first Peeler across the line was Ashley Perks in a quick 22:19mins. Shaun Coyle finished with a personal best in 23:03mins. Tim Mudd was the next Peeler to cross the line in 25:12mins with Dave Fern in 25:40mins and Robert Hirst with a time of 28:42mins. Peel Road Runners meet every Tuesday and Thursday evening at 7pm at the Snowdome in Tamworth. New members are always welcome.